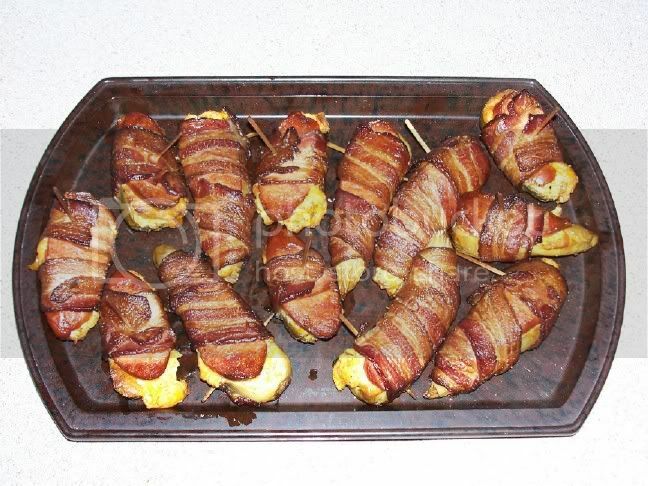 - Mix cheese, garlic, onion, rub, mustard, mayo and BBQ sauce together and incorporate well. - fill each pepper half with mixture and top with a slice of sausage. - wrap the bacon around the turd trying to cover as much of the turd as you can. - Use a tooth pick to hold bacon in place. - cook in the smoker on a sheet of foil for about 45 minutes to 1 hour at about 250 degrees till bacon is crisp. I like to give em a brush with some BBQ sauce 15 minutes before the come out. Thought I would dig this one up as I know some one is looking for it. There are also a couple of yellow banana pepper ABT's in there as well. Them look amazing!!! Great job! I made these this weekend, and they are great!!!! Gald ya like em Kosmo. Its been a while since I have made em. Hope to make a batch next weekend. I have given my old smoker to a good friend who wants to learn to make BBQ. I have been feeding him well for a couple years.. I think it will be smoked cajan chicken and ABT's for the first class. Just dug this oldy out and might be makin a batch this weekend.